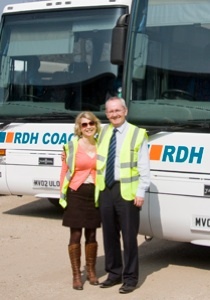 RDH Coaches have successfully supplied coach hire throughout Sussex for the past 30 years. A truly family business RDH Coaches is owned and operated by Tom and Gina Hawthorne and Derek Hunnisett having originally been founded by their family. We offer a wide range of coaches from 16 seat minibuses up to 57 seat executive coaches. Our coaches offer a variety of services such as air conditioning, DVD players, tea and coffee facilities, toilets, and PA systems. All coaches are fitted with seat belts and comply with all the latest legislation regarding safe coach travel. An experienced and professional driver, who wears uniform, has a full CRB check and receives regular training. A safe and reliable coach which meets all legal requirements regarding safety, maintenance and insurance. Knowledgeable and friendly voice on the end of the phone who will answer all your questions and ensure you have a good journey. Easy booking and payment and once booked a 24 hour contact number. We have many years of experience in the coach industry and can help with all aspects of planning your travel requirements. A coach trip or tour is only as good as its preparation which is why we spend time prior to your departure discussing your requirements, planning your itinerary and carefully checking everything to ensure that your trip is trouble-free, relaxed and enjoyable. If you would like a coach or minibus quote you can complete our online quote form and we will get back to you as soon as we can. Alternatively you can call us on 01444 470000 to discuss your coach hire requirements and we will be happy to answer all your questions. I am writing to thank you on behalf of our group for the most wonderful service we have received from yourselves and the company. Everything went according to plan seamlessly, the driver was brilliant with our members – courteous and nothing too much trouble. As it was my first attempt as Events Co-ordinator I send my personal thanks, as my life was made so much easier with your efficient service. Look forward to speaking again!